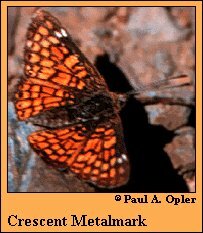 Identification: Upperside checkered with orange and brown. Underside orange with wide white bands. Flight: Several flights in Mexico from April-September. Adult Food: Nectar from flowers of Eriogonum abertianum and Aloysia species. Range: Chihuahua and Sonora, Mexico north to the Chiricahua Mountains of southeastern Arizona. Conservation: Extirpated in the United States. Original report may have been erroneous. NCGR: G1 - Critically imperiled globally because of extreme rarity (5 or fewer occurrences, or very few remaining individuals), or because of some factor of its biology making it especially vulnerable to extinction. (Critically endangered throughout its range).